EXCLUSIVE What better way to mark a milestone than with our Birthday Wishes Cake topped with a glittering birthday-year tribute! 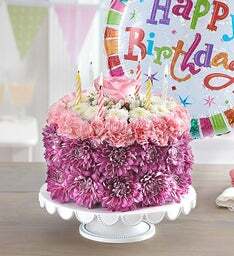 Crafted with fresh carnations and poms in soft hues of pink, lavender and white, this pastel pleaser comes with a tinsel milestone topper of 40, 50 or 60. It’s a uniquely delightful centerpiece for a memorable celebration. Want to make the day even more special? A birthday balloon will take the fun to new heights! 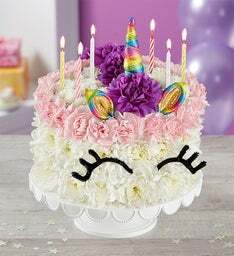 All-around, 3-D cake-shaped floral arrangement of pink mini carnations, lavender cushion poms, white button poms, and gypsophila, topped with candles and the number “40,” “50,” or “60” crafted from gold chenille.